A sudden release of stored energy in earth’s crust that creates seismic waves is termed as Earthquake. Most earthquakes are related to compressional or tensional stresses built up at the tectonic plates which make up the earth’s surface. This usually happens when the tectonic plates get locked up and are not able to slide past each other. The moment magnitude scale is a very sophisticated scale used now a days which for measuring the intensity or size of earthquake i.e. the amount of energy released. Earlier Richter scale was used for measuring the intensity of the earthquake. Seismologists assign a magnitude rating to earthquakes based on the strength and duration of their seismic waves. An earthquake measuring 3 to 5 is considered minor or light and is mostly imperceptible; 5 to 7 is moderate to strong; 7 to 8 is major; and 8 or more is catastrophic. Intensity of shaking is measured on the Mercalli scale. There are two types of seismic waves viz; P waves and S waves. Primary waves (P-waves) are compressional waves that are longitudinal in nature. Secondary waves (S-waves) are waves that are transverse in nature. P-waves travel at around 6–7 km per second S-waves travel at around 3.5–4 km per second. P Waves can travel through any type of material, including fluids, and can travel at nearly twice the speed of S waves. S-waves can travel only through solids, as fluids (liquids and gases) do not support shear stresses. 1. 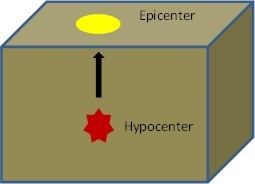 Epicenter-That point on the Earth’s surface directly above the hypocenter (focus) of an earthquake. 2. Hypocenter-The point on the earth’s surface where the first sign of disturbance is reported i.e the site from where the waves originate.